What is "energy" in terms of bodywork? There is a Universal Energy Flow that is within everything. The same kind of energy that created the Universe is within each of us. Every cell and every tissue in the body vibrates with this life force. In biology, energy balance is the biological homeostasis of energy in living systems. There are energy meridians and energy centers in the body that not visible to the "normal" human eyes, but they exist. There are people, such as medical intuitives, that can "read" the body. These people have used their gifts to assist traditional doctors with a patient's health care. When there is an imbalance or blockage of this flow of energy, a state of dis-ease exists in the body. During energy work sessions, the therapist works to help open up any blockages and help balance the "flow". Nancy uses her Reiki II attunement, energy and spiritual education along with her intuition to work with the energy in a client's body. This work is very subtle, but powerful. There are many forms of energy work just as there are many types of massage therapies. Natural Harmony massage offers: Chakra Balancing and Jin Shin Do Acupressure. 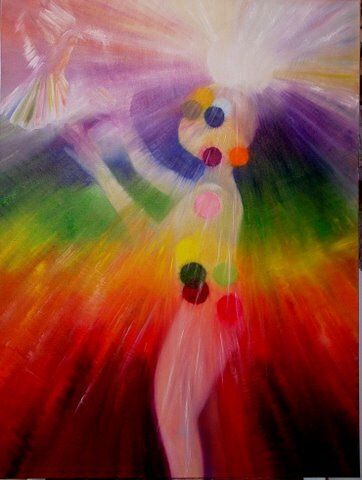 To put it simply: Chakras are wheels of light/color/energy that spin and vibrate within and around our body. There are 7 main chakras. The vibrational frequency of each of these chakras correspond to a color (ROYGBIV) and a note of the musical scale (Do,re,mi,fa,sol,la,ti). The energy in the 7 chakra centers impact the organs of the body in the area of a given chakra. The colors in the auric field that surrounds the body of living beings are affected by the strength of the vibration and direction of the spin of the chakras. The 7 chakras are the ones that will be addressed during your chakra balancing session. For more information on chakras, you may want to read "Anatomy of the Spirit" by Carolyn Myss and/or "Wheels of Light" by Rosalyn Bruyere. What is Jin Shin Do Acupressure? Jin Shin Do Acupressure releases emotional and physical tension via deep finger pressure on acupressure points with verbal focusing and emotional processing techniques. "Acupressure" refers to any technique using finger pressure on "acupoints" to reduce stress and balance the body energy. Jin Shin Do brings about pleasurable, deep relaxation and increased awareness of both body and psyche. Jin Shin Do contrasts with acupuncture in the absence of needles. Jin Shin Do is based on the "Strange Flows," which provide a shortcut to balancing the body energy. It uses a unique 45 point system, a color-coded chart and simple "release examples" (like recipes) . Jin Shin Do uses these powerful points, by pressing one or more "distal points" while a point of tension, or "local point," is held. The distal points help to release tense areas more easily, deeply and pleasurably. Acupressure theory says that body- mind well-being is also influenced by energy balance in the "channels" or "meridians" lines of related points through which Qi (energy) moves. Jin Shin Do recipients report experiencing this "energy flow" as a pleasant "tingling" or "streaming."